Early 1990's in a Cambridgeshire garden. I don't think I've seen so many together. I've hardly seen any atall this year. This is a photo from less than 20 years ago. It shows how quickly the world can change. The Butterflies or the Years ????? Very interesting ...what is the flower there that they were so drawn to?..It is lovely as well. Not many years ago, by the fall, these sedums would have turned pretty pinks and purples in numerous gardens and would be absolutely smothered in butterflies. Sadly it seems the butterflies have disappeared in many areas. Great picture - such a shame we now see it as a rarity .Certainly not in these numbers . Sometimes these butterflies settled in such numbers that I couldn't see the sedum plants underneath ! Hi TT, do you have any Buddleja bushes in your garden? We have a few and they self-set everywhere too. In July they are covered in butterflies just like on your photo. We see, Tortoiseshell, Red Admiral, Peacock, White. It may be worth having a butterfly bush to bring them in. There are Buddleja bushes in neighbours' gardens, but only the occasional butterfly gets tempted in. I guess your area is more countrified, which helps. I am amazed!! Never seen this sort of number together. 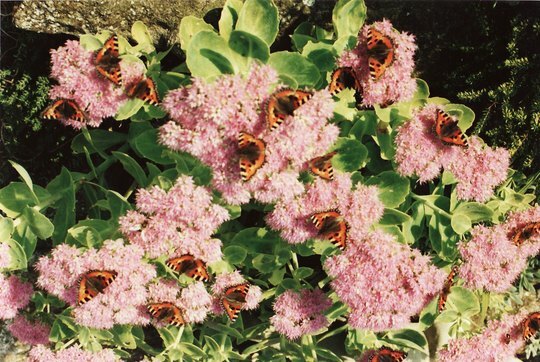 About 20 years ago is was a common occurrence to see many more than this number of butterflies on just one sedum. They would arrive in groups, completely covering the plants. No Skippy ~ Not quite lost it yet. I know you've seen this. That last piece of the message was for Gillian. When things are more settled, I'll look back in old photos. I might have some pictures with even more butterflies on sedum. Flora and Fauna just flew away. Lol. Lovely picture! Does make you realise just how fragile our planet really is. thats so nice to see so many at once i only saw 2 this year how sad to think how many there were a few years ago do any of you know other plants that would attract them?theres a buddlia that hangs over my garden but never seen a butterfly on it? Above on this thread Dawnsaunt mentions Buddleja. You're much more likely to see butterflies if you live in an area surrounded by lots of countryside. Maybe others reading this can please suggest more plants which interest butterflies. Thanks. I'm sure it's gardeners' fault I'm afriad. 20 years ago, before the likes of groundforce showed people what they could do with their plots, not so many people were interested in gardening. Plots that were previouly patches of weeds (AKA wildflowers) were suddenly tidied up - old patches of nettles were removed etc. (I'm as much to blame as anyone). I know some people blame the use of insecticides in the countryside more - but really, I think I see more butterflys in the countryside than I do in town these days? I don't totally blame the gardeners. In towns and villages there used to be lots of odd corners of wasteland etc, which had nettles and weeds. Nowadays these odd patches have all gone. With the value of land, every square metre is built on or put to use in some way, or sprayed with weed-killer by the Councils. Nowadays, it seems the only way to have lots of garden butterflies is to live in the countryside. There is something missing from this picture - four legs, hairy chops, waggy tail. No, can't think what it is. e.g. there is a feathery one on an armchair. But don't worry, I'll soon revert to type. The hairy, waggy-tail ones are never far away. and as the comments get longer it's harder to scroll up to 'like'. Lol. One of the amazing sights we saw last year was of a Humming Bird Moth on our Centranthus (Red Valerian). My husband called me over to see it and we were amazed!!! It was just like a miniature Humming Bird and hovered just the same, truly remarkable. Why is it you never have your camera with you when you need it! Humming bird moth ! Did you ever see it again? Sounds really amazing. Was this in the evening? Hi TT, We saw it about 3 times in total last Summer but not this year :( We saw it in the daytime, my husband remembers it was when it was hot and sunny. He's just told me that he does have a photo somewhere - will have to have a search! Not exaggerating, it was wonderful! The Centranthus wasnt a favourite plant of mine as they spread everywhere, but I let them do their own things now in the hope the moth will return. This brings back many happy memories of my childhood when I used to watch the butterflies settling on the Sedums in my parents garden. Thanks for sharing this photo T.T. Comments getting out of synch. here. Iv'e been known to change under the cover of darkness T.T, but only when theres an 'R' in the month and a full moon! Hope you can visit the garden some time in 2009 T.T. It seems that with the changes and improvements you've made, those visitors returning for a second or third time will find different plants, ornaments and designs to delight. This is great, TT! A previous garden in a previous home used to be filled with Peacock butterflies, due, I hope, to my plant choices. I'd have to scan a whole scrapbook, though, to show it. As for my childhood, a vivid memory is running through grassland filled with Ox-eye daisies, clover, Bird's-Foot-Trefoil, and Sheep's-Bit Scabious, trapping those little perfectly blue butterflies in jam jars (although we werre always made to let them go after a short study). Where have those butterflies, not to mention the wildflowers, gone? None exist here, anymore! Good comments. Have you seen Jacque's recent blog where she made a hedgehog 'hotel' in her garden? It's fun to read, with great photos. Glad that the cats made a gap to help the fox get through! You've made me think about nettles. I have a place where I could plant some nettles. I'll do that and see if it brings in more butterflies. Thanks for your beautiful memories of meadows, butterflies and wild flowers. An idyllic wonderland. I've seen a hummingbird moth in my garden. Last year I spotted it on the buddleja. This year I found it visiting my Eryngium planum - I scampered off into the house to grab the camera, but alas it was gone when I returned. Maybe next time! A pity you didn't get the photo, but very good news about the positive sighting of the hummingbird moth. Aye, we be a hardy lot down this way! If anyone wants a root of nettles I have plenty, lol. We are very lucky because our field is a meadow and looks a real picture in the Spring and it is hedged witih hawthorn. Sid: I was amazed at the size of ithe moth, wasnt you. I've seen a humming bird in the Caribbean and to be honest this moth was almost as big. We have a photo somewhere but need to find it, think it may be on a computer that we dont use now, or maybe its on an old mobile phone. Well it is raining, might talk my husband into searching for it. Dawnsaunt - yes, they are pretty big. I think it was the shape and way of moving that caught my eye the first time - just had to go over and investigate. I think it's amazing when they do their drinking nectar while on the wing thing. And they're fast too! Ooo - Skippy - that website is a bit creepy at first, 'We Know Why You Came', (shiver...) ;-) but funny after that bit! The UK ones are like the ones with clear wings on that site. They must use so much energy to keep their wings going all the time and they manage to keep so still! Don't get real hummingbirds over here, so these are a nice alternative, tho not very common. I've just checked out www.hummingbirdmoth.com. Amazing photos. Will you get to yours before Sid vaults the Polemonium and captures her moth on camera ? I think I have to admit defeat :-( Went through 2 old computers last night and a couple of old mobile phones. Found lots of other pics though like Bonnie as a Baby - will be uploading some garden photos later. The funny thing is we can all remember the photo of the moth, it was in mid-flight. Why is it that you can never find the one thing you are looking for? That's a pity you can't find the moth photo, but maybe it will turn up when you're looking for another picture. Thank you for your recent blog which is a follow-up to this photo. i had a buddliea that had actually got so big it was a tree, white one, and a few years ago it was covered in peacock and red admiral butterflies when you shook a branch it was like petals falling there were so many!!! but this year i think i only saw a handful, is it global warming? Yes, please also check out Dawn's blog. I'm glad this photo has brought back happy memories of gardens filled with butterflies. That's a fine picture. I grew several Sedum\ spectabile this year but never saw a Butterfly anywhere near them. . I think any of us old enough to remember those days of Birds, Butterflies, Bees and other wild life, should count ourselves very lucky. I'm sure you don't mind my mentioning that you are one of GoY's more senior members, so you presumably remember decades in the 1930's and 1940's when there were even more butterflies than in the above picture ? My photo was taken less than twenty years ago. The difference has happened alarmingly quickly. Thanks for your comments. Unfortunatelly the conclusions of several studies around the world including here in Brazil are signaling for extinction. The weather conditions,(see:http://www.sciencedaily.com/releases/2006/05/060508170906.htm) has significant influence on both, the "dormancy" and the "hostage". Brazil was famous for its art, using the wings of Callicore hydarnis and others, now the government have created a project to save the "blue butterflies. The UFRGS (Federal University of Rio Grande do Sul), has 25 hectares of natural forest reservation where you can appreciate the blue butterflies. The school of Biology and Botany are responsible for the area. Just for info... more than 2000 blue butterflies are destroyed to build a tea table board with about 50 cm diameter. Thanks for all this information. I'm pleased to know that the Brazilian government has a project to save the blue butterflies. It is so sad seeing our butterflies disappear on a global scale. New BBC TV series is coming. Aleyna ~ do you get to see any BBC shows in Brazil ? Showing how to encourage more wildlife into your garden. This could really get gardeners all around the country thinking about butterflies and other wildlife. Hi TT, I'll make a note of 19.11.08, perfect!! Wow... ,what an amazing sight to see ! Hopefully on day soon you will have a repeat performance. I'm still waiting for my first time....LOL. wow..that's like butterfly speed dating....may be they have settled down? Just about everyone on GoY is planting shrubs to attract butterflies, so we're doing our best to bring back as many butterflies as possible ! wow....so many butterflies and all in one spot. Let's hope 2009 is a good year for butterflies. Get to the bottom of the queue Indy! how did I miss this one , stunning TT adding to my faves now! Yes... we need more butterflies...!!! Part of the reason I asked for one of my GoYpedia pages to be Sedums, is that I can get an idea in which areas of Britain Sedums seem to attract the most butterflies... I still hope to add lots more photos and blogs to that GoYpedia category..
Will bear it in mind for next year sweetie and i'll trawl my old snaps for you to when I have the time, must have some somewhere! Wow! Time really does bring on changes. I've seen several butterflies flittering about but not all attending the same bush at the same time. This is a lovely sight, TT. That's too bad. I'll cross fingers, eyes and teeth that they do just that. I haven't noticed a lack here, at least not yet. Which of your flowers do the butterflies seem to prefer? Hands down the Mexican sunflower. Wherever it is in bloom it always has an abundance of butterflies flitting to and around it. Is the Mexican sunflower different to "normal" sunflower? Is it on your GoY pics ? Yes it is. Check out page one of my photos for an example.